Once you’ve exhausted all the typical places to hang your hammock, how else are you going to spice it up? If you’ve had enough of trees, read on for some new hammock-hanging places. If the soothing back-and-forth of lying in a hammock isn’t enough for you, add some lapping waves to the mix and you’ll be in a zen state in a few seconds flat. Find a pair of trees next to a lake, river or ocean, and if you’re really lucky, look for trees that bend right over the water, so you can hang suspended over the waves. Take out your fishing rod and see what you catch! Or, if you’re really up for an adventure, build your own hammock boat and take it for a trip. We’ll admit that not every beach is dotted with picturesque palm trees that are the perfect partner to a hammock. If you can’t swing it on the beach, hang your hammock near a pool. Any two poles or trees will do. The poolside hammock is a perfect place to while away the day with a book, and a favorite among kids too. 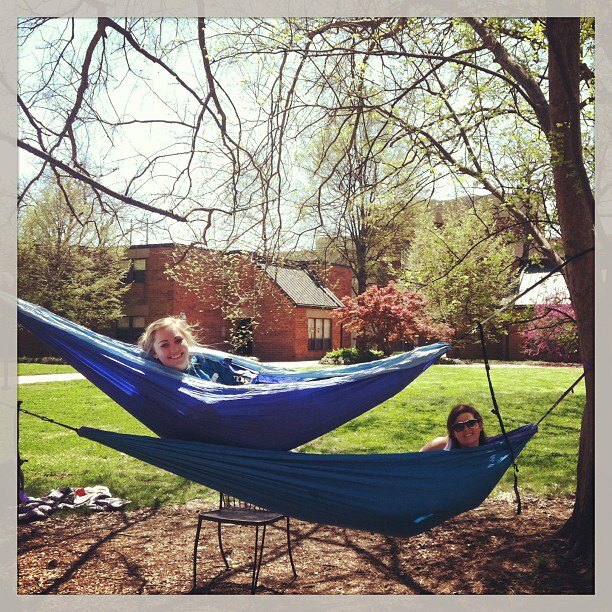 Hammocks aren’t just for the beach. They may have originated in the tropical climate of South America, but a hammock is the perfect way to take a break when you hit the slopes. Skip the long wait for a table at the chalet and find a quiet place to sling your hammock between trees and over the powder, then cozy up and relax. With all your ski gear already on, you’ll stay nice and toasty in your own private refuge in the mountains (not to mention you’ll be the envy of all the other skiers). Outdoor festivals can be the highlight of the summer for young and old alike. But festivals mean lots of time on your feet, and often there’s no good place to give the legs a rest. Unless, that is, you bring your own. The lawn chair is the old staple, but if you want to really do summer in style, hang up your hammock, kick back and relax. Some festivals have already caught onto the hammock trend and started hanging their own, but there tends to be a lot of competition to snag one of these, so avoid the wait and hang your own. No front porch is complete without a hammock. Install a couple chair hammocks for a contemporary take on the classic porch swing, or hang a hammock with a spreader bar for a truly tropical feel right outside your front door. You might even befriend a few neighbors who want to hang out in your hammock from time to time. No porch or deck? If you live in a tiny urban flat in a city of millions like I do, you might not have a view of trees out your window. But this has never stopped me from slinging a hammock up just outside my door, or in this case, out my window. A fire escape can make the perfect spot to sling a hammock (but check your local laws first to make sure you’re not violating any). Turn the public park into a cozy space for reading, napping or snoozing with a ha7mmock. Any two trees will do, or if there aren’t trees, two light posts will do the job just fine. But don’t be surprised if strangers want to know just where you got your hands on a hammock. They might even want to give it a try themselves! If you’re short on trees, or if you just want to impress everyone who walks by, you can stack two hammocks one above the other using the same trees or poles. It might take some acrobatics to get into the top hammock, and you might have to use trial and error to get the height of each hammock just right, but the result will be well worth it, I can assure you. With all the childhood charm of a bunk bed but way more street cred, double decker hammocks are a crowd pleaser and a great place to pass the day with friends or with family. For the best results, we suggest the ever-versatile and easy-to-hang travel hammock, which features the EasyAdjust suspension system for a quick setup. Forget trying to sleep on hard and rocky ground. Instead, enjoy the comfort of sleeping suspended in the air in a lightweight travel hammock. Not convinced? Read more about why you should ditch your tent and camp in a hammock. You read it right. Why wait until you’re in the mountains or on the beach? You can enjoy a hammock every single day from the place where you spend more time than anywhere else. Sure, hammocks are a great way to create a comfortable place to call your own in the outdoors, but they also work in reverse by bringing the free and soothing feeling of resting suspended in the air into your own home. Not convinced? Here are 7 more reasons to hang a hammock inside. No problem! You can get a hammock stand. With a hammock stand you don’t have to worry about finding the right places to screw into walls—you don’t even need any trees. Want even more places to hang your hammock? Check out this video for even wilder hammock inspiration.